The Highlands Trail is a project that seeks to preserve hiking recreational opportunities and preserve habitat and water resources along a broad band of foothill and watershed systems linking the Hudson River from north of Bear Mountain, southwest across Sussex, Passaic, Morris and Hunterdon Counties to the Delaware River in Riegelsville, NJ. When complete, the trail will link the full distance of the Highlands from end to end, a 150 mile footpath network for the more than 1.1 million acres of this distinct physiographic province. It will be possible one day, within the Highlands Trail network, to hike from almost any park or forest in the region to another. You can find detailed trail descriptions and maps here. Pudding Stone at Bearfort Ridge on the Highlands Trail, Greenwood Lake. Photo by Mike Mykowski. The interests in preserving the larger ecosystem and completing the trail network as envisioned, are compelling. 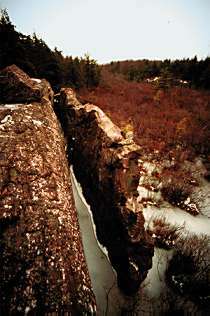 The Highlands are a large part of the Reading Prong, a subset of mountains and ridges in the Appalachian chain that extends south from Danbury, Connecticut to Reading, Pennsylvania. Nearly one-seventh of the land area of New Jersey lies within its boundaries, and it's the prime water resource for a population of over four million people--a number equal to the combined populations of Alaska, Connecticut, Delaware, North Dakota, South Dakota, Vermont, and Wyoming. The Highlands is also a greenbelt to the north and west of one of the most urbanized areas on the planet, and within a two hour drive almost 20 million Americans. The original home to the Lenni Lenape, the iron-ore-laden Highlands spawned a rich and long-lived service to the independence and history of America, providing munitions during the Revolutionary War and sustaining intense industrial and technological development during the nineteenth century. The Highlands Trail, under the stewardship of the New York-New Jersey Trail Conference, has recently earned the Millennium Legacy Trail designation, one of only fifty in the United States, and giving it singular status among New Jersey's natural and historic pathways. In addition to making it eligible for extensive financial aid, the trail will be marked by special White House Millennium Trail plaques and be promoted as part of the National Millennium Celebration. Currently, about 150 contiguous miles of the trail are open for public enjoyment heading south from the NY state border, passing through Long Pond Iron Works State Park, North Jersey District Water Supply Commission, Norvin Green State Forest, the Pequannock Watershed, Mahlon Dickerson County Reservation, Allamuchy Mountain State Park, Stephens State Park, Schooley’s Mountain County Park, the Columbia Rail Trail, Lockwood Gorge, Voorhees State Park, Spruce Run Recreation Area, Clinton Wildlife Management Area, Tower Hill Reserve, Jugtown Mountain Preserve, NJAS Deerpath Sanctuary, Sweet Hollow Preserve, Musconetcong Mountain Preserve and some private lands. For example, the Trail winding along the shore of Echo Lake, in Newark's Pequannock Watershed lands in Passaic County, is an easy section. For a challenging, lung-gasping experience, climb Windbeam Mountain in Ringwood to dangle over the Wanaque Reservoir, which supplies 25% of New Jersey residents with water. Furnace remnants at Long Pond Ironworks, Hewitt. Photo by Wilma Frey. If historic features interest you, consider the Long Pond Ironworks Historic District within the State Park of the same name. With its scheduled tours, you can experience both historic and scenic delights in one outing. 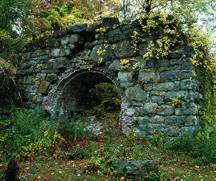 Or, explore some former iron mines on your own in Norvin Green State Forest. New Jersey's Highlands were our nation's cradle for the Industrial Revolution. The Highlands' ore-laden hills nourished the independence of the United States with iron mines and forges that dotted the region producing cannonballs, wheels, tools and other implements. The famed West Point iron chain across the Hudson River was cast from NJ Highlands ore. Revolutionary War battles were fought throughout the Highlands because of its strategic significance. General George Washington led military campaigns in the Highlands and over-wintered his headquarters several seasons in the region. For a breathtaking vista that stretches to the horizon in all directions, climb from Union Valley Road to the firetower on top of Bearfort Ridge. Here you are in the Pequannock Watershed, home to over 400 black bears, as well as bobcats, river otters, occasional bald eagles, rare, threatened and endangered species, and breeding territory for scores of species of neotropical songbirds, hawks and waterfowl. 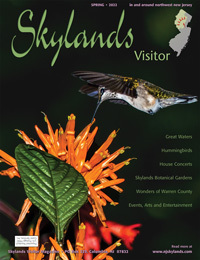 The Highlands Trail also visits state wildlife management areas, including Sparta Mountain WMA in Sussex County, increasing your chances of seeing some wildlife on the Trail. Glacial erratics, Norvin Green State Forest. Photo by Wilma Frey. Does geology interest you? If so, look for the unique purple conglomerate called Bearfort Puddingstone on Bearfort Ridge. 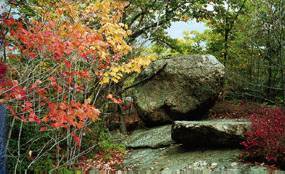 Or keep an eye out for glacial erratics, large isolated boulders left on rocky ridgetops tens of thousands of years ago by the retreating glacier. Every season has an appeal on the Highlands Trail. From late May through early July, mountain laurel and rhododendron burst into fantastic bloom. Earlier in the spring, observe delicate native wildflowers or fern fiddleheads as they emerge from their winter slumber. On a sweltering hot summer day, visiting a cooling waterfall can be appealing; try the Chickahoki and Post Brook waterfalls along the Trail in Norvin Green State Forest. Fall color in the Highlands is dramatic and rivals New England, with hardwoods and shrubs turning brilliant reds, oranges and yellows against the green of conifers. You may hike through golden light filtering through maple leaves, stepping on a golden carpet of fallen foliage. 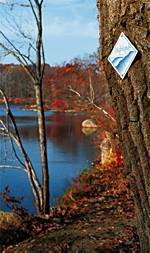 "Leaf off" winter hiking allows you to enjoy views that are hidden at other seasons. For up-to-date Highlands Trail information and detailed trail descriptions and maps, click here! The Highlands Trail, an ongoing project in association with the National Park Service and the New Jersey Conservation Foundation, is well on its way to its destination, a rendezvous with the shores of the Delaware River. The NY-NJ Trail Conference is responsible for developing the on-the-ground route of the Trail, and also cooperatively maintaining it through a partnership among volunteer trail clubs, community groups, private landowners and public agencies. For additional information about the Highlands region, visit the Highlands Coalition website or call (908) 234-1225.